Investors - West Timmins Transaction Details - GFG Resources Inc. This Letter of Transmittal is for use by registered holders (“Rapier Shareholders”) of common shares (the “Rapier Shares”) of Rapier Gold Inc. (“Rapier”) in connection with the proposed plan of arrangement pursuant to section 288 of the Business Corporations Act (British Columbia) (the “Arrangement”) whereby, among other things, Rapier Shareholders will receive 0.15 of a common share (each whole share, a “GFG Share”) of GFG Resources Inc. (“GFG”) for each Rapier Share held, to be considered at the special meeting of Rapier security holders to be held on February 15, 2018, or any adjournment(s) or postponement(s) thereof (the “Meeting”). On the Effective Date upon completion of the Arrangement, all right, title and interest of the Rapier Shareholders in the Rapier Shares will be transferred to GFG and the Rapier Shareholders (other than Dissenting Shareholders) will be entitled to receive, in exchange for each Rapier Share held, 0.15 of a fully paid and non-assessable GFG Share. In order for Rapier Shareholders to receive GFG Shares for their Rapier Shares, Rapier Shareholders are required to deposit the share certificates or DRS Advices representing the Rapier Shares held by them with the Depositary. This Letter of Transmittal, properly completed and duly executed, together with all other required documents, must accompany all share certificates or DRS Advices for Rapier Shares (the “Deposited Shares”) deposited for GFG Shares pursuant to the Arrangement and this Letter of Transmittal. 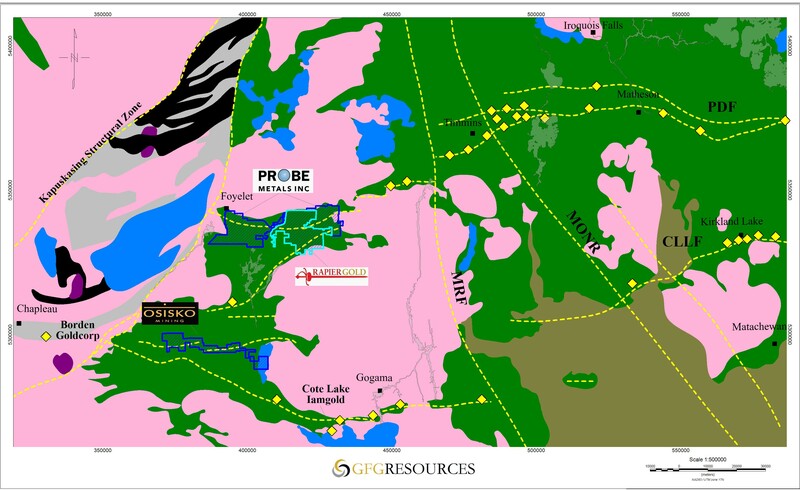 Strong strategic investor support: GFG is pleased to welcome Probe Metals and Osisko Mining as significant stakeholders in the pro forma company. Form 8937 – Rapier Gold Inc.